PREMIUM PACKAGE. MULTIMEDIA PACKAGE. PANORAMA ROOF. BURMESTER SURROUND SOUND. HEATED FRONT SEATS. NATURAL GRAIN BLACK ASH WOOD CENTER CONSOLE. Only 8,241 Miles! Scores 33 Highway MPG and 24 City MPG! This Mercedes-Benz C-Class delivers a Intercooled Turbo I-4 2.0 L/121 engine powering this Automatic transmission. SELENITE GREY METALLIC, REAR SPOILER, PREMIUM PACKAGE -inc: KEYLESS GO, Blind Spot Assist, SiriusXM Satellite Radio, Panorama Sunroof, MULTIMEDIA PACKAGE -inc: 8.4 high-resolution color screen, COMAND® Navigation, COMAND® Single CD/DVD, Touchpad, DVD Coding, Heated Front Seats, HANDS-FREE ACCESS PACKAGE -inc: HANDS-FREE Comfort Package, HANDS-FREE ACCESS, Electronic Trunk Closer, Dual Zone Front Automatic Air Conditioning, BURMESTER PREMIUM SOUND SYSTEM, BRUSHED ALUMINUM DOOR TRIM -inc: Natural Grain Black Ash Wood Center Console, Day-Night Auto-Dimming Rear view Mirror, Valet Function, Tire Specific Low Tire Pressure Warning, Strut Front Suspension w/ Coil Springs, Smart Device Integration, Side Impact Beams, Seats w/ Leatherette Back Material, Rear-Wheel Drive, Rear Fog Lamps, Power Rear Windows, Power Door Locks w/ Autolock Feature, Power 1st Row Windows w/ Front And Rear 1-Touch Up/Down, Outside Temp Gauge, Outboard Front Lap And Shoulder Safety Belts w/ Rear Center 3 Point, Height Adjusters and Pretensioners, Multi-Link Rear Suspension w/ Coil Springs, LED Brakelights, Gauges w/ Speedometer, Odometer, Engine Coolant Temp, Tachometer, Trip Odometer and Trip Computer, Gas-Pressurized Shock Absorbers, Galvanized Steel/Aluminum Panels, Fully Automatic Projector Beam Halogen Daytime Running Headlamps w/ Delay-Off. 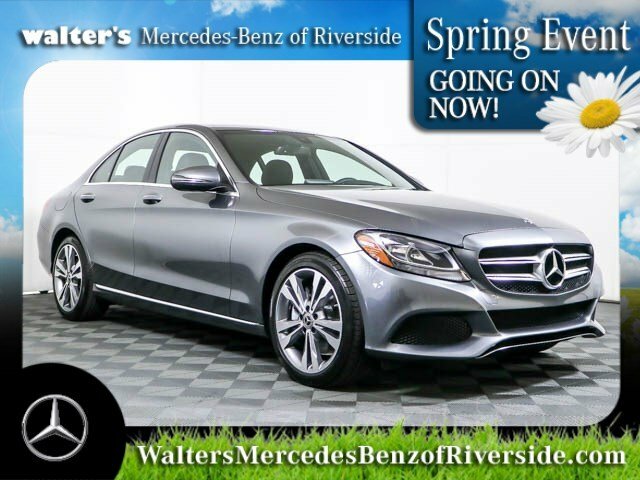 For a must-own Mercedes-Benz C-Class come see us at Walter's Mercedes-Benz of Riverside, 3213 Adams St, Riverside, CA 92504. Just minutes away!